What’s black and white striped all over? Zebras, of course! 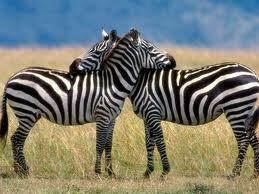 Scientists aren’t sure why zebras have stripes, but they believe the stripes might camouflage zebras from predators. Some scientists think the stripes keep insects away or even act as sunscreen. Nobody knows for sure, but each zebra’s stripes are as unique as your fingerprints. Each zebra’s stripes are as unique as your fingerprints. Something amazing all about zebras! Zebras live only in Africa. 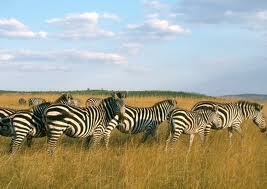 Like wild horses, zebras live in herds with a male, or stallion, leading a group of females and babies. Young male zebras join other males until they are big enough to have their own herd. A mother zebra keeps other zebras away from her baby for a few days. Once the baby recognizes its mother’s voice, they rejoin the herd. Sometimes zebras will gather by the thousands to migrate to new feeding areas. Family herds stay together even when they’re in these large groups. 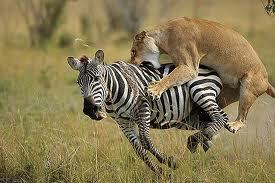 Lions and other large predators hunt zebras. If lions attack, zebras will make a circle and try to fight them off. Zebras are endangered. Finding food and water is hard for them. Some people hunt them for their skins or meat. Zebras live in herds with a male, or stallion, leading a group of females and babies. Lions and other large predators hunt zebras. An educational video about why zebras have stripes. Question: Can zebras be tamed? Answer: Zebras are not usually tamed because they are unpredictable and grumpy. They will attack if scared. Question: Are zebras as big as horses? Answer: Most zebras are slightly smaller than horses. But, it depends on the zebra, as well as the horse. 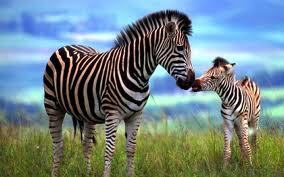 Enjoyed the Easy Science for Kids Website all about Zebras info? Take the FREE & fun Zebras quiz and download FREE Zebras worksheet for kids. For lengthy info click here. Declan, Tobin. " Zebra Fun Facts for Kids ." Easy Science for Kids, Apr 2019. Web. 26 Apr 2019. < https://easyscienceforkids.com/all-about-zebras/ >.